Chutney Preserves is a juxtaposition of workplace with exhibition stage, or perhaps more coherently, experimental lab with ceremonial site. We are the Chutney Preserves and we welcome you into our fold. CHUTNEY PRESERVES 8 - Camberwell, Eighth Wonder of the World! Sarah will be presenting the local legend of the Hermit who lived in the cave and guarded the magical well within. Ash calls his new Chutney commission, ST.DOMESDAY The idea is drawn from St Giles Church in Camberwell and the Domesday Book in which it featured. Tim invites you to see into the future and a post -apocalyptic Camberwell through the eyes of a Nuclear Bunker dweller. Phillip Raymond Goodman presents: 'the Buses of Camberwell Green'. John Ruskin has given his name to a park, streets and estates in Camberwell, but what was it that drove this sensitive soul away. At Caroline Gregory's stall, 'Effie's figs and fur' you will find some naugthty, edible horrors which, along with the noise of the steam trains playing in the background, would be enough to send John Ruskin running. Records- a portal to other dimensions, coveted talismans with unsuspected power. Join Rachael House in uncovering the mysterious and arcane origins of Rat Records. Welcome them back as one of the eight wonders of Camberwell, draw or write on them about where you have come from, before their flight begins again. Jo's wonder will be a giant inedible custard pie inspired cake sculpture. Emulating the Fun Factory that once stood on Camberwell's hallowed ground. It will be a splendid, day glo, glittering and awe inspiring Chutney Wonder. "Cake" It will form the centre piece for a fun filled splat fest extravaganza where you will be invited to hit target with a mini custard pie. Every Bulls Eye wins a prize! THE BEAST OF CAMBERWELL GREEN is believed to live in the long abandoned Camberwell underground tunnels and resurface to forage for food on Camberwell Green at night. Some say The Beast escaped from a Victorian medical experiment, others believe it to be space alien or an ancient tree nymph. Sightings have increased over recent months, perhaps you have seen or heard something? In June 2014 Professor Frog Morris plans to capture The Beast and exhibit it at Chutney Preserves Fair. Cast your wishes into the abyss of the Camberwell and marvel at the wonders you will fish out from it's murky depths! Scott Wood presents: 20 Wonders of Camberwell From a sacred off-licence to a ghostly lion-tamer to Aleister Crowley’s father-in-law and the worlds smallest school mistress, Camberwell is full of strange and wonderful things. Join Scott Wood, host of the London Fortean Society and author of London Urban Legends: The Corpse on the Tube as he goes through twenty Camberwell legends, mysteries, ghost stories and hidden histories. 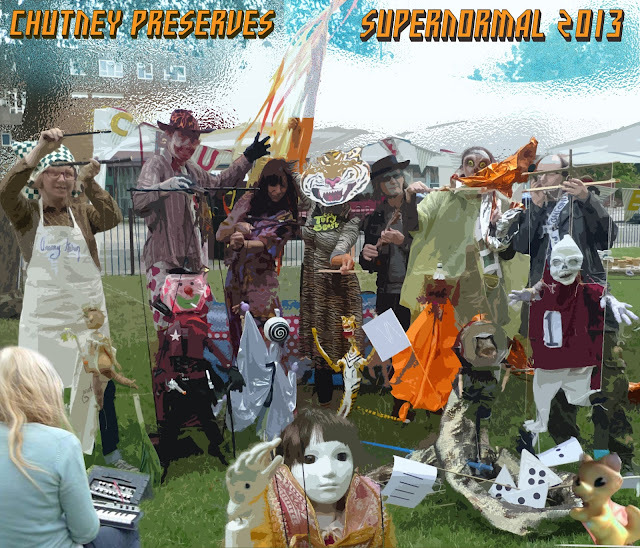 Labels: "Camberwell Arts Festival" "Camberwell Green" "Sarah Sparkes" "The Chutney Preserves"
Chutney Preserves wil be taking their Chutney Puppet Camp to SUPERNORMAL this year. You will find us on the Village Green area on Saturday 10th and Sunday 11th August. We will be performing, processing and generating interactive double-dealings and belly-talking mayhem. Make your own cathartic puppet at our workshops and come join the Chutney family. The ‘magnificent seven’ (plus zero) Chutney Preserves artists are. Initiated in 2005, artists’ collective Chutney Preserves have worked with over 100 artists and participated in six festivals and events including: Lambeth Country Show in Brockwell Park and Camberwell Arts Festival on Camberwell Green. Chutney Preserves manifests for a magical seventh time in 2013 and The ‘Magnificent Seven’ artist/puppets will patrol Braziers park and periodically assembling to perform in the Chutney Marquee. Supernormal visitors can join the merry-making and make their own marionette at Chutney Puppet Camp. When all seven come together something extraordinary will manifest! Chutney Preserves was initiated by Marq Kearey and Sarah Sparkes and is currently is herded by Sarah Sparkes. Chutney Preserves 7: SEVEN, a set on Flickr. 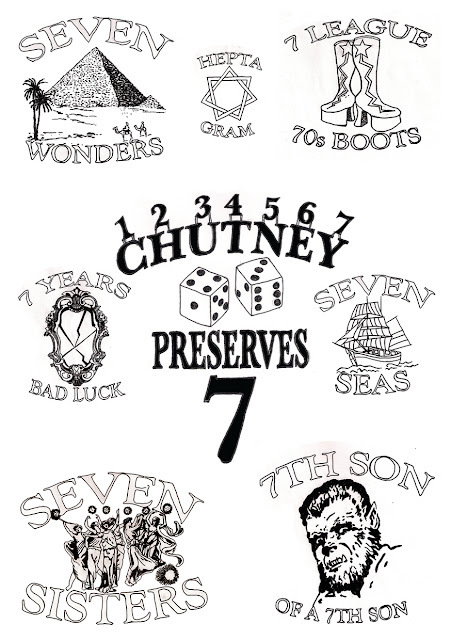 Chutney Preserves called on the power of SEVEN at this years Camberwell Arts Festival 2013. See their 'rare doings' up close by clicking on one of the little pictures above! 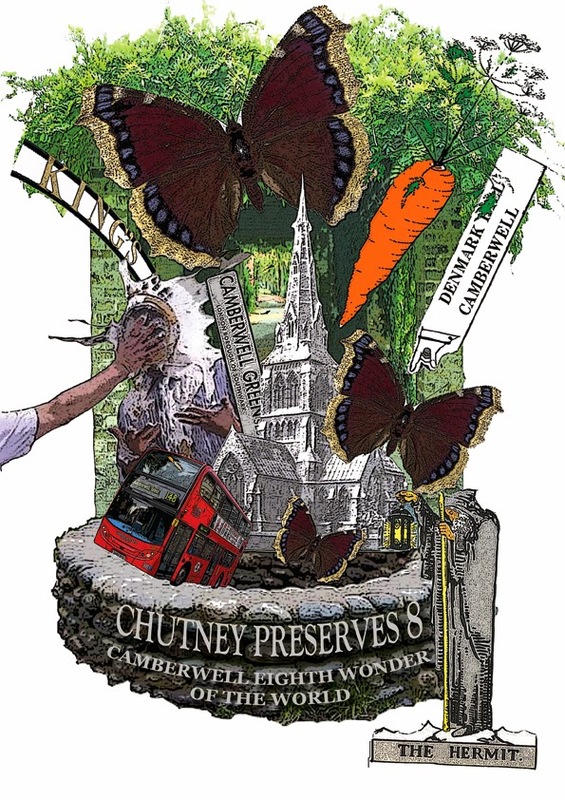 Camberwell Arts Festival - 'Chutney Preserves SEVEN' 23 June! The Chutney Preserves invite you to particiapte, or just watch in wonder, as they initiate ‘THE SEVEN’ in an afternoon of belly-talking puppetry and other rarey side-shows. SEVEN artists have made SEVEN puppets - when all SEVEN get together, summoned by the mysterious ZERO, something magnificent will happen! Please note puppets and your soul may be eaten as part of this process. Throughout the afternoon, FREE Puppet making workshops for all will enable you to materialise your inner Chutney. A marching version of the A Band will manifest amongst the mayhem and Chanteuse ‘La Severine’ will serenade us. Magpies and vegetables are on the menu at an uncanny cafe. full details of the days events coming soon! Are you the SEVENTH son of a SEVENTH son with SEVEN sisters, SEVEN years bad luck and SEVEN league boots who met a man going to St. Ives with SEVEN Wives? SEVEN is a magic number, SEVEN is a secret number, SEVEN is a sacred number, SEVEN is a virtuous number, but is SEVEN your lucky number? Sail the SEVEN Seas to see the SEVEN wonders of the world; commit SEVEN deadly Sins and ride the SEVEN Colours of the Rainbow to SEVENTH Heaven; deliver SEVEN Sermons to the Dead and then light a SEVEN Year Candle to cure your SEVEN Year Itch. 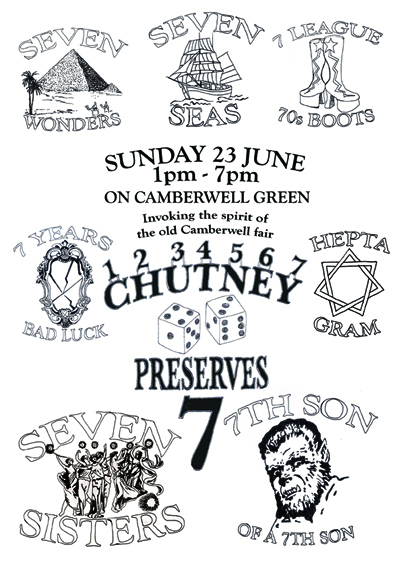 On the SEVENTH day of the week - Sunday - come to Camberwell Green for Chutney Preserves 7: SEVEN. The A Band, Sarah Doyle, Marie-Cecile Embleton, Rebecca Feiner,Ash Fitzgerald, Tim Flitcroft, Phillip Raymond Goodman, , Caroline Gregory, Miyuki Kasahara, Calum F. Kerr, , Jude Cowan Montague, Joanna McCormick, , Tessa Sillars-Powell, Libby Shearon, Sarah Sparkes, , Charlotte Squire, A Goat and others. Chutney Preserves raises its slimy head for the seventh magnificent time; SEVEN is the magic number and our theme this year! Chutney Preserves welcome your proposals for performance, participatory actions, temporary art works, rarey side-shows, interactive double-dealings and other interventions. There will be small marquee and tables available on request. You are encouraged to bring your own tent (if you have one) to pitch for the day on Camberwell Green to act as your HQ or to make-over in a suitable fashion. The event will be publicised and archived as part of Camberwell Arts Festival and through the Chutney Preserves website. There will be flyer, copies of which can be posted to participating artists on request. You will be joining the Chutney family and will be looked after - kept fed and watered - with cheese and chutney sandwiches and beer. The joy of Chutney will stay with you always. Sail the seven seas to see the Seven Wonders of the World; commit Seven Deadly Sins and ride the Seven Colours of the Rainbow to Seventh Heaven; deliver Seven Sermons to the Dead and then light a Seven Day Candle to cure your Seven Year Itch. Chutney Preserves return to Camberwell Green this June for Camberwell Arts Festival. This is the seventh Chutney Preserves and we take that magical number as our theme. We are seeking submissions and will send a call out shortly. Chutney Preserves 6 -The Puppet Games, a set on Flickr.